Fairer Skin in a Few Weeks? Is it possible? From dark to fair in 6 weeks, it is possible? How to make skin fair in few weeks! Haven’t you often looked into the mirror and felt dismayed by your dark skin with a blemish here and a scar there? Haven’t you wished for a magic wand that would make all the darkness, tan, spots and blemishes go away forever? Of course, if you were born with a peaches and cream fair complexion like Kareena Kapoor’s, then you would be an exception to this rule! But then real life is never so smooth, so fair, so flawless, is it? Yes, life is so unfair that a lucky few are just born with a fair and glowing skin. The rest of us just rue and moan about our dark and dull skin complexion that never seems to get better no matter what you apply or don’t apply on to it. But you know what; your skin can be made fairer like never before in just 6 weeks. Science has made it possible for anyone to get fairer and I am here to tell you how. From dark to fair in 6 weeks, it is possible. No, I am not kidding. I am not building castles in the air. I am not promising the impossible. It is true. It is very much possible. Anyone can get a skin tone that’s several shades fairer than what they were born with. All it needs is a steady routine, complete commitment and correct knowledge of which products to use. There is also the small matter that just fair skin is not enough. You also need to add glow and flawlessness to your newfound fairer complexion to look your most stunning! More of that later. Before we rise higher on the fairness freeway, let’s explore the darkness a bit. Let’s know what makes our skins go dark and darker. To know how fair skin can be attained, we first need to know what makes the skin dark. The skin turns dark because of melanin – a pigment that’s produced by skin cells lying beneath the skin layer called epidermis. These melanin producing cells are named melanocytes and they use an enzyme called tyrosinase to make melanin. People with dark skin produce more melanin than those with fair skin do. Basically melanin is skin’s way of protecting it from sun damage. Of course, nowadays we can simply use a cream with good SPF and give our skin all the protection it needs easily without needing extra melanin. Then there is the problem of unhealthy complexion. Patchy, spotted and uneven skin doesn’t look good no matter how fair it is. These problems arise because of uneven melanin distribution on the skin. If melanin were spread evenly throughout the skin, it would be a uniform colour. But that never happens. Regrettably, the skin has a tendency to create melanin zones that then appear as spots on the face. So when I tell you about how to make your skin fairer, I will also tell you about how to bring maximum evenness to your fairer skin. First. Let’s learn a basic rule of fair vs dark. Less melanin means fairer skin. It is that simple. To make skin fairer, all we need to do is to make our skin stop making extra melanin. And for this to happen, we need to block or inhibit tyrosinase (the enzyme that makes melanin that darkens the skin). So the real question here is how to block tyrosinase and thereby block melanin and thereby gain fair skin? And that’s what I am about to tell you now. 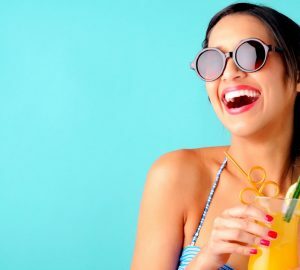 Avoid sun, stay in shade, use products with high SPF – Sun’s rays and your skin’s melanin – they are partners in crime laughing cruelly behind your skin’s darkness. The more you expose your skin to sun, the more its melanin content grows, the darker you become. So try to stay indoors during sunlight hours. At least, avoid going out during peak midday hours when the sunlight is at its cruellest worst. When going out, don a hat or wrap a scarf, carry an umbrella, and, most important of all, use a product that has at least SPF 20 to keep your skin safe and fair under the sun. Make C-T-M (cleaning, toning/ moisturizing)your twice a day must-do ritual – Your skin looks fairer and better if it is clean, toned, free of surface pollutants, and moisturized. So wash your face using a good face wash (we recommend Garnier Neem Face Wash and Forest Essential Delicate Face Wash), followed by a good toner (Garnier’s and Nivea’s toners are really good), and last but most importantly, moisturize your skin to give it the intense nourishment it needs to look is best. I understand that keeping track of so many products can be tedious. The best thing here would be to find a cream that moisturizes as well as makes you fairer. I have evaluated several leading brands and in my opinion, WOW Fairness Cream is the only one that combines optimum fairness with high sun protection (it has SPF 20) and intense moisturization. Eat fresh food rich in healthy vitamins, antioxidants and minerals – To look its best and fairest, your skin needs healthy nutrition as well as internal protection from free radicals that need to be nullified by vitamins, minerals and antioxidants. So junk the junk food and fried, greasy, sugary dishes that make you look bloated. Instead eat all those seasonal fruits rich in healthy nutrition (berries, guavas, mangoes, bananas, oranges, pineapple, papaya – all are great in keeping your skin looking fair and fine. Drink lots of water – The fifth point en route fair skin is water. Pure, unadulterated water that your body and skin love to be nourished by. Your body needs water to flush out toxins and your skin needs water to stay hydrated and healthy. 8 to 10 glasses a day is a must if you want your skin to look its best. Give some TLC to your eyes too – Last but not the least; puffy eyes with dark circles are an enemy of your skin’s overall appearance. Imagine having fair skin with eyes that look ghostly because of dark circles and puffiness! I advise using a good under eye gel to tackle this issue. And my recommendation for the product of choice goes to WOW Under Eye Gel. It really makes the skin around your eyes fair and healthy. Believe me; you look not only fairer but much younger as well! Double bonus, right? So now you know the 6-point formula to make your skin fair and flawless. Now let me come back to the first point – your fairness cream. You need a fairness cream that’s powered by 5 scientifically proven tyrosinase inhibitors and melanin blockers. Mother Nature has given us many potent plant extracts that are loaded with natural and safe tyrosinase blockers. A few of these have been part of our traditional wisdom which is now being proven correct by scientific research. There is one more factor. The effectiveness of these plant extracts requires strict quality control. You need to be very careful of the quality aspect. Then there is the matter of blending. In a quality skin care formulation, these extracts will be blended in a carefully researched and clinically proven ratio. When you apply these in the correct dosage, these work as a powerful team to penetrate skin cells and stop tyrosinase formation in its tracks. That in turn leads to low melanin production. Bingo! Your skin gets fairer. Mulberry extract – This is derived from the root bark of mulberry tree (scientific name: Morus alba). Regular application of this extract in proper concentration inhibits tyrosinase activity and makes skin go fairer. Liquorice extract – A really safe and gentle but very effective skin whitener, this natural extract is rich in two compounds – glabridin and liquirtin. Also an anti-inflammatory skin soother that lightens red patches on skin. Clinical research has shown it to be effective in reducing tyrosinase activity and improving fairness. Saffron extract – As you know, saffron is prohibitively expensive but a trusted grandma’s cure for good complexion. Well, the grandma was right all along. Saffron does make the skin go fair by lifting away dead skin cells to reveal fresh skin from underneath. Kojic Acid Dipalmitate – This is another safe, powerful and natural skin whitener found in mushrooms. Like mulberry and liquorice extracts, it too inhibits tyrosinase that in turn means your skin produces less melanin and looks fairer. Kojic acid is also a potent antioxidant that saves skin from free radical, pollutants and sun damage. Vitamin B3 – Also known as niacinamide, vitamin B whitens skin by blocking melanosome transfer to stop pigmentation from occurring. Plus, vitamin B also makes skin smoother and suppler. Use a fairness cream that contains these amazing skin whiteners and you will see your skin transforming in a matter of weeks! So which fairness cream contains all these super-effective skin whiteners? People have researched extensively through all the fairness creams available in the market and ONLY ONE CREAM contains all these five natural skin whiteners. That cream is WOW FAIRNESS CREAM. What’s equally good and worth noting is that WOW Fairness Cream contains no harmful hydroquinone. Its fairness action is gentle, fast and skin-friendly. No harmful side effects, no undesirable reactions. I have read its reviews and talked to various users (most of them swear by its effectiveness!) and everyone has nothing but praises for this skin fairness solution. Every user says that they noticed their skin changing for better in a matter of days after they started using WOW Fairness Cream. A few had their skin becoming fairer by five to six tones! Almost everyone had his or her skin becoming fairer by at least three to four tones. It does not matter what skin tone you were born with. You can make it several shades fairer by following my 6-point fairness formula. Last reminder – Do remember to choose your fairness cream very, very wisely. Be sure to check its ingredient list to ensure that it has all the melanin blockers you need to get fair. Apple Cider Vinegar – What is it all about? 4 Ways A Fragrant Body Wash Can Make You Feel Like A Diva!